What We Love is up! I am loving the Space Dye Twist Cosmic Teal but I need them to be High Rise Wunder Under Crops. 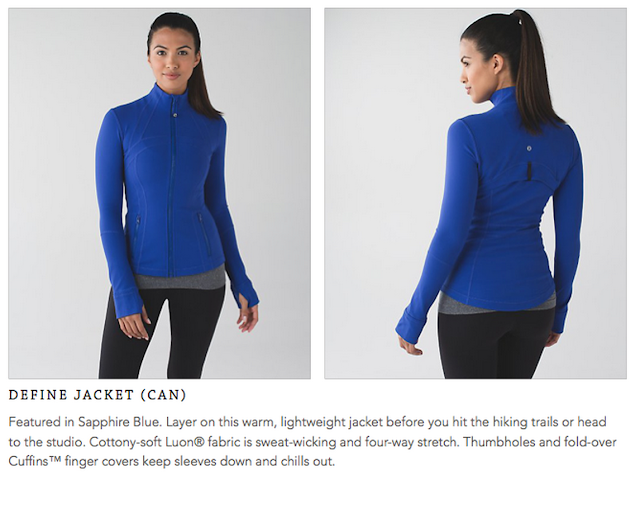 Also, the Sapphire Define Jacket is just gorgeous! 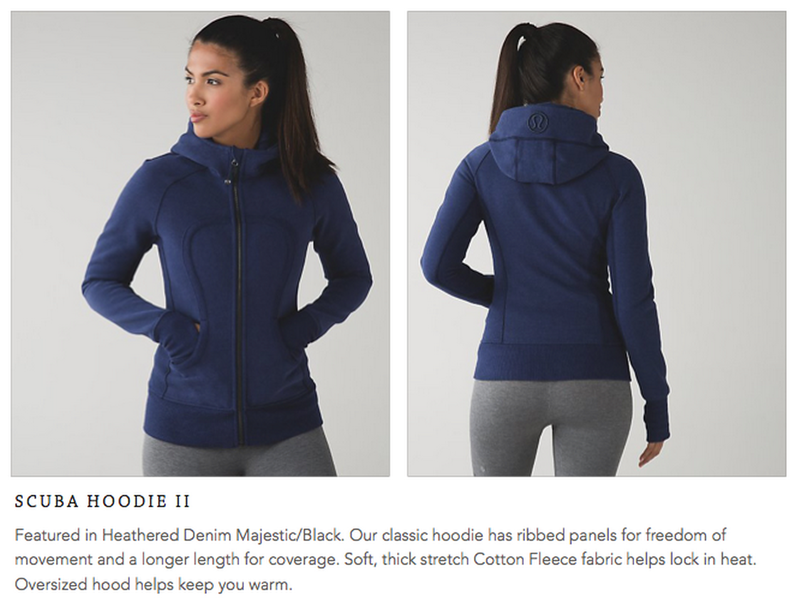 "Fit Review: Sunset Savasana Pullover"
Just got my restored/stirrup WUP. Actually really liking (was hoping I wouldn't) but will be returned the black pair because the contrast between the Luon and Luxtreme is just too noticeable – the back panels look grey compared with the Luon panels. This didn't seem to be a problem with the other colors. I did end up preferring the look of the pair with the contrasting lower leg much more than the solid colored pairs, FWIW. I love all these striped bottoms but it is just so hit or miss with the stripe alignment. I am THRILLED to see more greens and blues, though. And is it just me, or is inventory not moving as fast overall? Wow, sorry about my seriously sloppy, typo-laden post! Ugh. Have been crossing my fingers for a sapphire define. This could be expensive month. Love the teal stripe hope that comes in Luxtreme. Just bought the UV twist speed tights and love them. Now still holding out hope for sapphire studio pants. Now wishing I waited for a Sapphire Blue Define instead of getting the Daily Practice jacket. Oh well, I have tons of Defines and the Daily Practice is a nice change even though Defines are my fav. I got the Sapphire Practice Daily too and so I'm not getting the Define. I'm pretty sure I prefer the Practice Daily. Really hoping for a solid Teal Define! I'm hoping for a Forage Teal Swiftly, Scuba III, Stress Less or some kind of Vitasea LS. Basically, a Forage Teal anything. I'm with you. Forage teal is my kind of color. 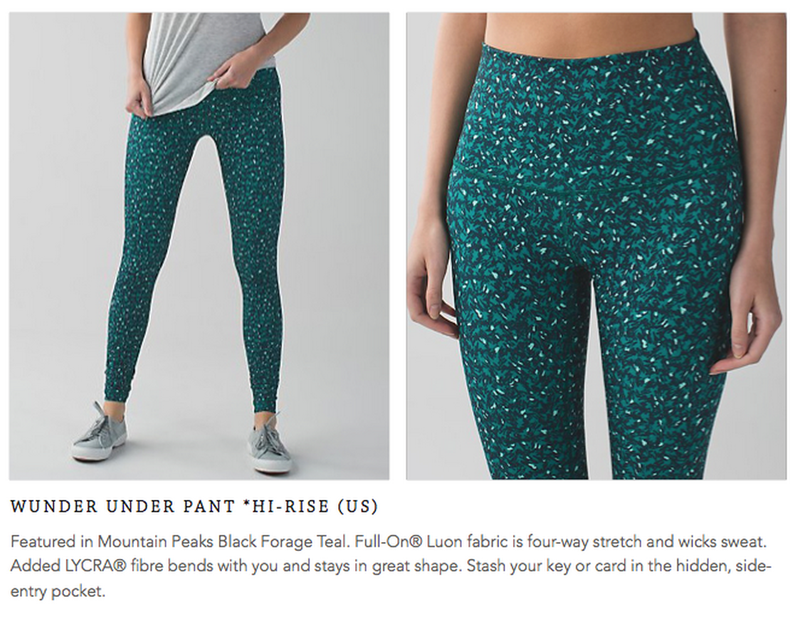 my wallet is safe yet again – whew – these prints do nothing for me – kinda remind me of old navy or nike stuff — was hoping for the tofino splash CRB – maybe they will surprise us and the tank in bon bon or even speed shorts in that colour. I am enjoying the LLL holiday! I would love a tofino splash CRB. When I first saw it I liked it but wasn't sure I loved it enough to buy it and now I'm really loving it. Ohh I love the teal stripe WUC IIIs but I agree Id want a hi-rise in either crop or full length or 7/8ths, the hi-rise is sooo flattering and smooths things out under a CRB so Im kind of hooked on hi-rise. However, I almost want to order these in the meantime just in case they dont come out because this is my color pallete to a T! 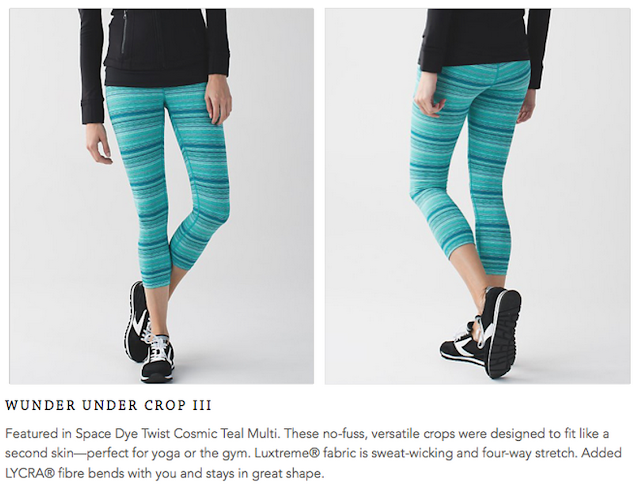 I love the Teal stripe WUC too, but only if they aren't Luxtreme material. It says there are Luxtreme…. not sure if this is correct or not… Really hoping they're textured like the Sapphire ones. How is the sizing of the define jackets? I usually don't wear really tight tips to exercise, so I need a size that I will have enough room to zip the define up (usually i am a 6 or 8). The Defines are snug fitting. You may want to try it in a size up from your usual tops size seeing as though you prefer your tops looser fitting. If your tops are a 6 or an 8 then maybe try an 8 or perhaps even a 10. I like to wear my Defines snug and can only wear snug fitting tanks and Swiftly tops (short and long sleeve Swiftly tops) underneath, but that's how I like it and wouldn't want to wear anything else underneath them anyway. Hope that can help! Still waiting for some dark colored CRBs. Bordeaux Drama and Majestic would be nice! Me too! Really wishing for more nice CRB colours. Yes!! Me too! I really wan the Bordeaux CRB to hit the US. Would love Majestic. Fingers crossed! I am hoping for a solid Bon Bon Define. I saw the energy bra in Bon Bon in store and the colour is far nicer in person than on the website. Will keep my fingers crossed although my wallet says otherwise…. Bon Bon is gorgeous. Such a flattering pink! I've been waiting for a solid sapphire define so it's a dream come true! 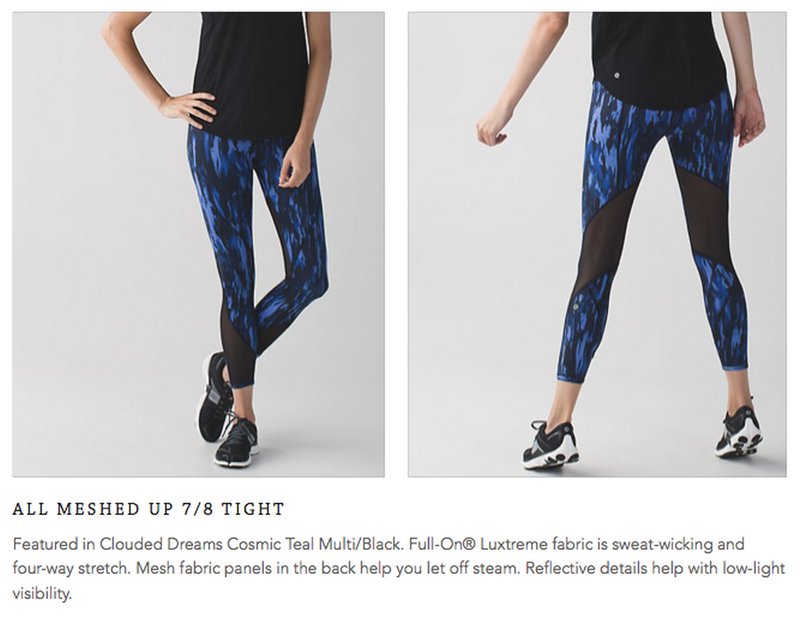 Two off topic questions: First, I see a lot of people complaining about striped and patterned Swiftly LS, but I had an ED tell me those ones are actually more durable and less likely to rip/pull/etc (I'm very anxious about buying one for running and having this happen). Can anybody confirm? 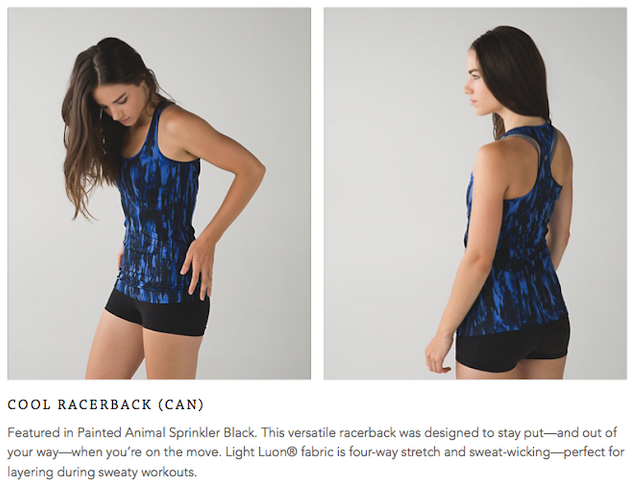 Second, I tried on an Amala tank because my store doesn't have the Barre None yet – from looking online, they look almost the same. Do you guys know of any differences in the two (other than the extra set of seams along the front of the Amala and the thinner/ribbony straps on the Barre None)? I dont like the material the rugby stripe and new pattern ones are made out of. It is not as soft and stretchy or as comfortable to wear. I have never had any problems with any of my Swiftly tops and have been purchasing them for years. Oh wow! Nearly every review on the website complains of holes and rips, it's awesome that you've never experienced that.